Welcome to a first edition of #SillySunday! Before you ask this is NOT sponsored, I was walking by my local Perfumania store and saw this huge Pitbull cutout through the window, being the inquisitive butterfly that I am I went in to investigate, and saw that he was there as part of an instagram contest and despite the fact I had on no makeup and was not quite feeling my most 'photo ready' I decided to enter anyway! "Miami has inspired me on every level. The culturally diverse city has taught me that although people may be different, we are a lot more similar than we think, especially when we come together to play. I wanted to capture that energy and spirit into scents for every man and women to wear," ~ Pitbull. This is part of an instagram contest hosted by Perfumania to win a 4 Night "Pitbull Inspired" trip to Miami and 5 'runner-ups' will receive a $100 Perfumania Gift Card! 4. Visit Perfumania.com/pitbull and login and upload your photo from Instagram to be entered to win (you can 'login' with any of your social accounts to make it faster, it will scan them looking for the photo, when it finds the one with the hashtag, PRESS on it until you see a check mark on the photo, THEN hit submit) - It really is EASY PEASY! This Latina Lifestyle Blogger would love to win a trip to Miami to meet Pitbull! 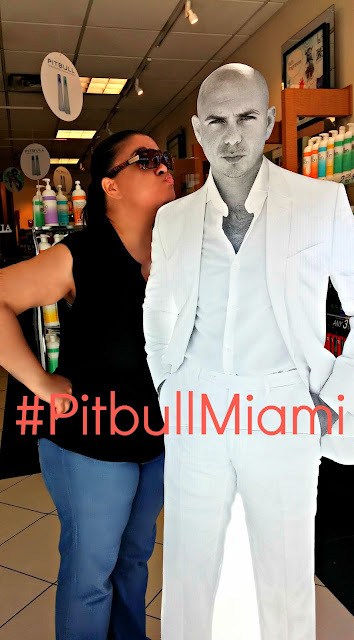 If I win I am going to tweet that #TheOfficialTwitterPartyDJ finally met #Mr305, #MrWorldwide in person and definitely will post a side-by-side instagram of me with the cutout and then me with the real Pitbull! I'm already packing my bags, I have never been to Miami and can't wait to see all the cool things Miami has to offer. I have been suffering from a severe case of Wanderlust lately as I didn't get to travel anywhere this summer and am thinking this trip would be a great belated summer getaway for me. Can you tell I really want to win? Are you going to visit your nearest Perfumania and take a photo with the Pitbull Cutout? HURRY! You have until 11:59 AM on Saturday, October 3rd to get your entry in! What is your favorite Pitbull Song? If you win, take me with you for giving you the heads up! FTC Disclosure: This is a NON -compensated post, no monetary compensation has been received. All my opinions are 100% MY OWN. I am disclosing this in accordance with the Federal Trade Commission 16 CFR, Part 255 - Guides Concerning the use of endorsements and testimonials in advertising, you may check our Giveaway and Disclosure Page for additional information regarding Ascending Butterfly Disclosure. This sounds like a pretty good prize. I'm not really into rap, but I've always loved Pitbull because of his unique sound AND his style. The guy is just plain cool. What a lot of fun the runner-ups are going to have with their gift cards. I really do hope you are the grand prize winner so you can send us an update on what's new in Miami. Perfumania isn't in the Reno area yet (they are in Las Vegas, though). There's one in Folsom and in Roseville, CA but I won't be traveling to CA anytime soon to be able to enter. This sounds like a fun contest. I haven't heard of Pitbull Miami until today. I will check this out. This is a fragrance I haven't heard of but it sounds amazing! And what a great contest! I'm going to be checking this out for sure. What a fun contest. It sounds like you are mentally ready to win. Hope you win for sure !!! I met Mr.305 at an event he was so sweet to a little guy at the event as his ranglers were rushing him out he saw the boy call out to him an he stoped and spoke to him and took pictures with him now that is a man worth cheering for !! Dale ! Love the idea you had for a spur of the blog post base on just seeing the giant cut our of pitbull. I have heard his music... but have to admit if I had seen that cutout of him, I would have no clue who he was lol. Pitbull is certainly making moves in all different directions…perfume, huh? Good luck in the Instagram contest – that's such a fun pic that you took. I just wanted to share with you that my boyfriend won the Pitbull Miami contest, we already signed the release papers just waiting on the details, I'm so excited...Miami here we come! @Suzanne - Congrats! Did you hear about it here first? If so, can you please let the organizers know that?